There is no grandpa cooler than Morty's. And Rick is very Rick. If Rick & Morty's adventures have turned into your favourite series...you will love our Rick & Morty merchandise. We have Rick & Morty gifts that are so original you will freak out. 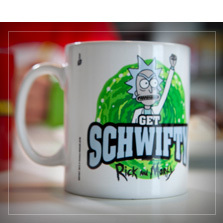 From the most fun Rick & Morty T-Shirts to the coolest breakfast mugs, coffee or beer mugs in the most stylish fashion. 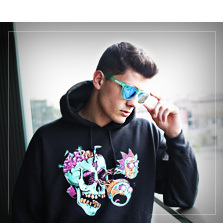 And for the more cold-blooded fans we have Rick & Morty hoodies (with zip, hood....) in all styles, characters and with most known scenes from the series. You don't have to be Mr. Meeseeks in order to get the best Rick & Morty merchandise. You have it all just a click away at Funidelia! Includes: black beanie hat with embroidered logo from the series on the front. If you have a friend who's birthday is coming up and is crazy about Rick & Morty, the animated series that is in right now, our Rick & Morty merchandise section is what you need. The best ideas to give a gift to a Rick & Morty fan. 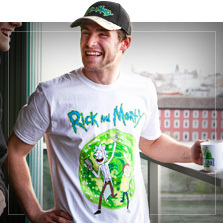 Rick & Morty T-Shirts, hoodies, mugs, socks, hats, caps... even Rick & Morty Funko Pop!. All models, characters and legendary quotes from the series: Scary Terry, Mr. Meeseeks, Bird Person, Jerry, Snuffles, Pickle Rick, Get Schwifty... everyone! 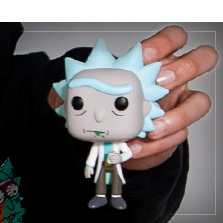 Forget your Wubba Lubba Dub Dub now and grab the best Rick & Morty merchandise for you or to give as a gift to whoever you want!